'Ther' festival was held in the ancient Koneswaram temple with five chariots before the Portuguese destroyed the temple in 1624 according to "Thirukonasala Puranam" written during the nineteenth century by a Tamil scholar Masilamanipillai Muttucumaru. A historian Isaac Thambiah in his book has given details of the Koneswaram temple ceremonies during the time when the Portuguese were preparing to loot and destroy the temple, quoting tales of one Sambasivam. "Eleven brass lamps were lit on the Hindu New Year day in 1624, when a ' fifth column' form of attack was engineered by the Portuguese. Emissaries and soldiers dressed as Hindu priests entered the temple during the New Year's Day ceremonies. 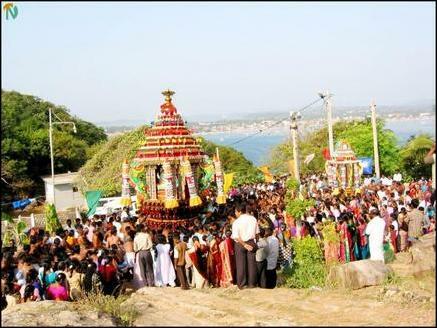 The processional statues of Siva and Parvati, in a chariot came down the hill on its way to the town. The temple was deserted by the crowd who flocked to the town to see the chariot. Portuguese pirates started their plunder. Gold, brass, copper, silk and jewels at the temple premises were looted. The priests and serfs, who remained in the temple, slaughtered. Some priest escaped, carrying with them images and temple ornaments they could save", said historian Mr. Isaac Thambiah in his research. 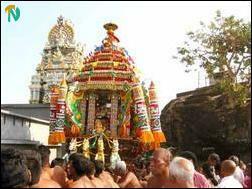 The new Koneswaram temple was built in 1963 and the first consecration (Maha kumabisheham) was held in April of that year. 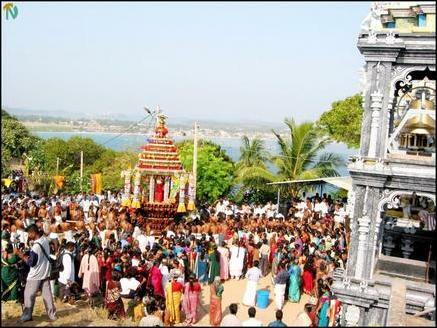 A Sinhala historian Dr.Paul E.Peiris has stated in his book that Thirukoneswaram was one of the five Eswarams (temples of Siva) in the island before the arrival of Vijaya. The date of the building of the original Koneswaram temple is recorded in a Tamil poem by Kavi Raja Varothian as B.C.1589, historical records say.